Police seal off church after Prime Minister Gilani enters the building. Ordinary worshippers and relatives of the slain minister are kept outside. Christians react with outrage, close ranks around the family. The bishop of Islamabad says he lost a “son”. Speaking to AsiaNews, he blames the Interior minister for the minister’s death. Bhatti is laid to rest in Khushpur with thousands in attendance, including Muslims, Hindus and Sikhs. Islamabad (AsiaNews) – “You have killed my brother, now you are stopping me from seeing his body [. . .]. You cannot protect the minorities,” said an angry and pained Anila Bhatti, when security forces prevented her from entering the church for her brother Shahbaz’s funeral. The service began at 11.40 am in Our Lady of Fatima Church in Islamabad. Right after Prime Minister Yousaf Raza Gilani entered the building, security forces closed the doors and did not let anyone in or out. A security perimeter was thrown up around the church, blocking access to the building. Christians who wanted to say goodbye one last time to the Catholic minister reacted by protesting. In the meantime, thousands of people travelled to Khushpur, the village in Punjab where Bhatti was buried this afternoon next to his father’s grave before a crowd of some 10,000 people. Mgr Anthony stressed how the Minority Affairs minister worked on behalf of discriminated minorities. “Whenever he heard that someone was being discriminated, he would rush to help,” he said. “Bhatti`s vision was to fulfil the dream of Quaid-e-Azam (Ali Jinnah, Pakistan’s founding father) in which minorities have equal rights and freely practice their religion”. “He wanted to repeal the blasphemy laws,” which he saw as “the root of the problems for Christians in Pakistan.” Certainly, “he never feared death” and “played a vital role in interfaith harmony, bringing together Christians, Muslims, Sikhs and Hindus”. After the last prayer by the apostolic nuncio, the bishop of Islamabad-Rawalpindi voiced his misgivings about the lack of proper security that led to Bhatti’s death, pinning the blame squarely on the government. A group of government ministers, including Prime Minister Gilani, took part in the service. The same cannot be said for many Christians, including some of Bhatti’s relatives, who were kept out of the church by police. Outrage worshippers lashed out, protesting. “Now you block the entrance of the Church,” but “where were you when Shahbaz Bhatti was killed?” said Maqbool Bhatti, one of the protesters. 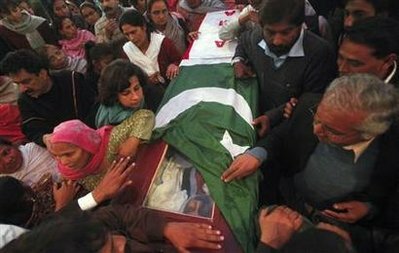 Even the minister’s sister, Anila Bhatti, was unable to attend the funeral. In a fit of anger and distress, she shouted, “You’ve killed my brother, now you are stopping me from seeing his body”. In fact, the authorities, she added, are not capable of “protecting minorities”. A delegation from the Muttahida Quami Movement (MQM) was also held up outside of the church. After the funeral service, the body was flown by helicopter to Bhatti’s native village of Khushpur, near Faisalabad, in Punjab. More than 10,000 people came for burial service (which began at 3.30 pm) in the local Catholic church. The burial was delayed by a few hours to allow people to pay their last respect to the slain minister. Hundreds of Muslims, Sikhs and Hindus, religious and political leaders as well as ordinary people, joined Christians to show their solidarity. Banners and posters hailing Bhatti were set up in the streets of the village. Crowds were calm and well behaved. No incident took place. People just endured their grief and pain. “Shahbaz Bhatti, son of the Nation, will be missed,” one banner read. Songs rang out as people shouted, “We will carry on your mission Bhatti" and " Bhatti your blood is the beginning of a revolution". A torchlight procession is planned for the later in evening. The coldblooded assassination of the Minority Affairs minister has unleashed a wave of popular indignation and protest across the country. Demonstrations were held in the streets of Lahore, Karachi, Faisalabad, Sialkot and Khushpur. Many public figures spoke out. Shahbaz Bhatti “gave his life for the cause” of minorities,” said Pervaiz Rafique, president of the All Pakistan Minority Alliance (APMA). “We will carry on his mission,” he added. Members of the National Commission for Peace and Justice (NCPJ) of the Catholic Church echoed these sentiments. Marching in Lahore, they called for the arrests of the extremists who killed the minister. They also hailed the life of Bhatti and that of the late governor of Punjab, Salman Taseer, who was killed on 4 January for opposing the blasphemy law and coming to the defence of Asia Bibi. In a public statement, the Joint Committee of Fathers (JCF) expressed its “deep grief” for the loss of a “patriotic statesman”, calling on the government “to go beyond the rhetoric of minorities enjoying all the rights in the country”. “The worst kind of extremist is developing”, said Rizwan Paul, from Life for All. The last word goes however to Shahbaz Bhatti’s family, which must be going through unspeakable grief and sadness. The family is “devastated by the huge loss,” Shahbaz’s elder brother, Gerard Bhatti, told AsiaNews. “From childhood, he was passionate for the rights of minorities and the weakest,” he said.